Subtle illumination from frosted glass sets the mood for chic sophisticated dining. 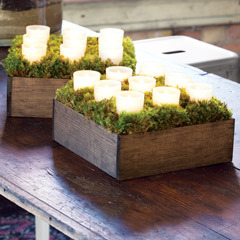 Six votives arranged in a dark stained hand crafted wood trough and surrounded by a bed of lush mosses creates a natural, glowing display. 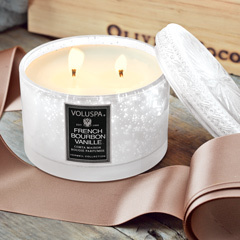 Trough measures 19" x 4" x 5" and comes packaged in Olive & Cocoa® gift wrap with ribbon. Frosted Votive Trough is rated 4.8 out of 5 by 6. Rated 5 out of 5 by MelM33 from Beautiful! We received this as a gift and adore it! It is the perfect addition to my husband's office. We've placed it on his reception desk so it is one of the first things his clients see when they walk in. You will not be disappointed with this gift! Rated 5 out of 5 by Robert from Frosted Votive Trough I ordered this item just before Christmas as a gilt. In that it was close to the holiday, I opted for extra shipping charges. Christmas came and went however my order was never filled. 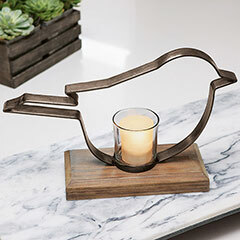 Rated 4 out of 5 by Hogan from Frosted votive trough I bought two for my Thanksgiving tables. They added the glow, and were very pretty. Rated 5 out of 5 by Dottie from Perfect ! Elegant Simplicity. 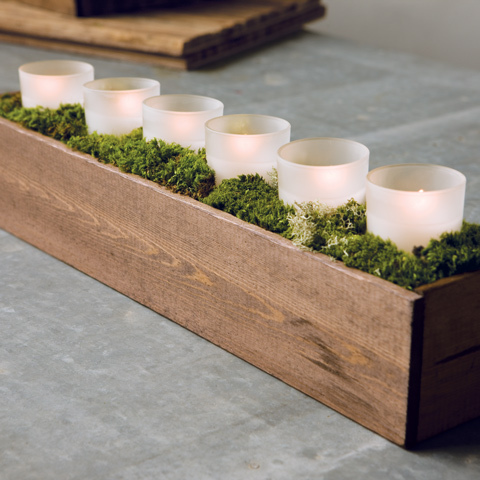 The Moss Votive Trough is an understated piece that can adapt to many applications . The recipients of this gift used it as a centerpiece ... Added leaves , accorns and other woodsy elements to create a tablescape. It looked stunning.. Rated 5 out of 5 by Stell from Good looking and very versatile gift. 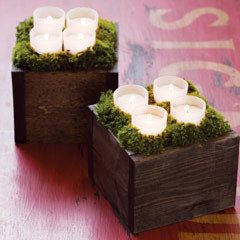 I have bought these candles numerous times as a house warming gift or as a condolence gift. I think it is beautiful and loved by anyone I have given it to. Rated 5 out of 5 by ddra from Beautiful Very nice, rust-modern arrangement! After 3 weeks, it still looks fresh. It also arrived very well packaged.